The Museu Picasso of Barcelona presents Impressionist and Symbolist pieces from the Musée d’Orsay in Paris and the Musée national Picasso-Paris. These works enable the public to fully appreciate the impact his first two visits to Paris had on the young Picasso. The Museu Picasso, Barcelona is taking part in the exhibition Picasso. Bleu et rose at the Musée d’Orsay, which will run from 18 September 2018 until 6 January 2019, with an exceptional loan of artworks. To enable us to continue to offer a coherent visit to our permanent collection, the directors of the museums organizing the exhibition in Paris, Laurence des Cars (Musée d’Orsay) and Laurent Le Bon (Musée national Picasso-Paris), have facilitated the loan in exchange of nineteen works by a number of major artists, including Cézanne, Degas, Gauguin, Steinlen and Toulouse-Lautrec, within the framework of the very fruitful cooperation between our institutions. The drawings, paintings and sculptures we are presenting engage in dialogue with the works in our collection, and in so doing allow us to show the decisive influence that the artists working in Paris in the early years of the 20th century exer- cised on the young Picasso’s stylistic evolution and his creation and consolidation of a language of his own. Clearly apparent here is his fascination with the avant-garde, as he begins – especially in the period between his first trip to Paris in October 1900 and his definitive move to live there in April 1904 – to forge his personal style and progress from a worldly painting to an art of a notably symbolic character. The issue of the magazine Pèl & Ploma for 19 August 1899 carried the announcement, dated 4 August, inviting the submission of works of art for inclusion in the Exposition Universelle to be held in Paris from 15 April to 12 November 1900. The deadlinefor submissions was given as 31 August, but was subsequently twice extended to 20 October. The announcement was greeted with considerable excitement by local artists, espe- cially the younger ones, as a great opportunity to make their work known in Paris. Picasso, who had by then taken part in several official exhibitions, presented the oil painting Last Moments, and on being selected for the new millennium World’s Fair he began to prepare his trip to Paris. Quite a number of Barcelona artists travelled to the French capital to visit the exhibitions and be present at the great public events. 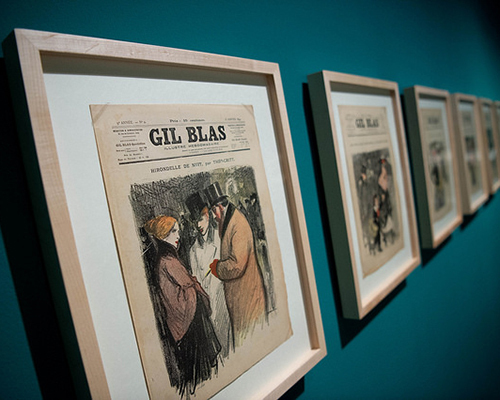 Ramon Casas arrived there even before the Exposition opened, and sketched many of the works on show, sub- sequently publishing his drawings with texts by Miquel Utrillo and himself in Pèl & Ploma. 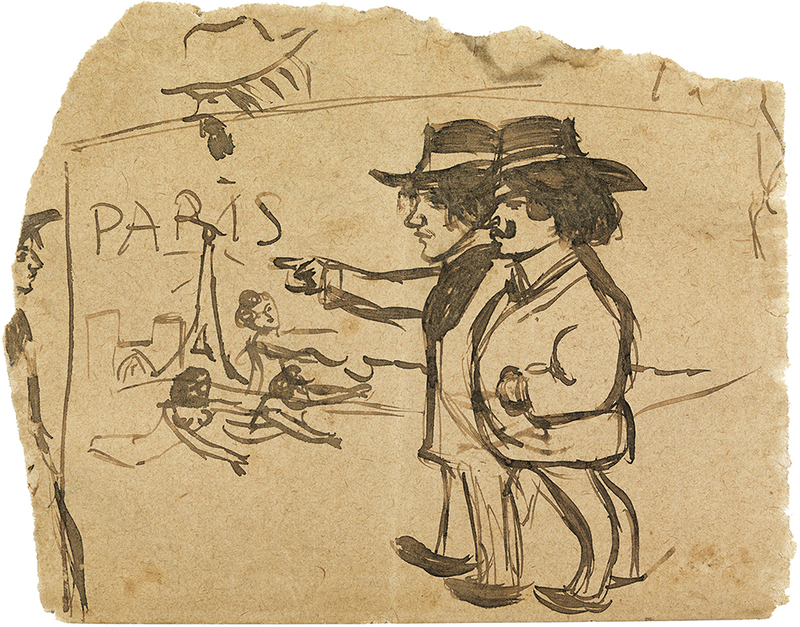 That Picasso, like the others, was eagerly anticipating this trip to Paris is suggested by the small drawing, made while still in Barcelona, in which he depicted Manuel Pallarès and himself in front of two of the city’s most iconic monuments, the Eiffel Tower and Notre-Dame. However, he had to wait until September 1900 to make the journey, accompa- nied by Carles Casagemas, as a note in the weekly Catalunya Artística indicated. The two artists were joined by Pallarès a few days later, and while there they kept in touch with their friends in Barcelona, maintaining a juicy correspondence with the Reventós brothers. 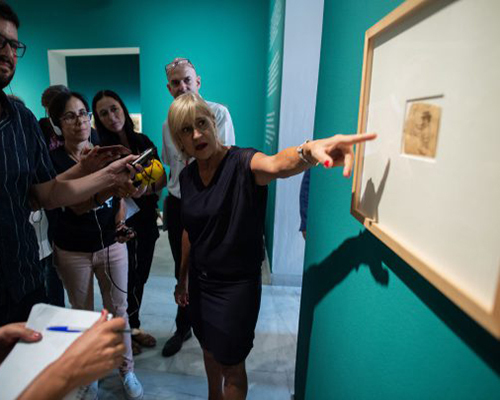 During the first few days they visited the major Exposition venues, where Picasso was able to see with his own eyes works by Manet and the Impressionists as well as the fringe exhibition – a personal retrospective – organized by Rodin in the Place de l’Alma. 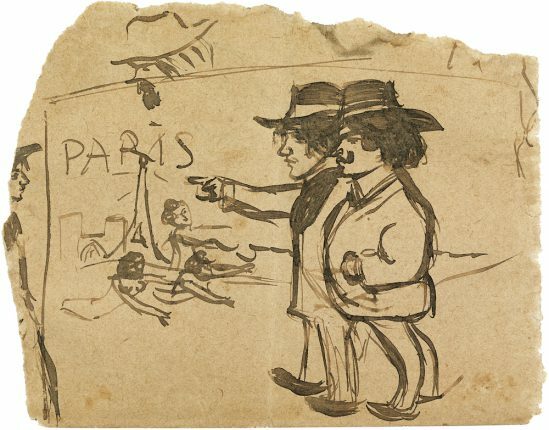 Picasso also spent time with his Catalan friends in Paris: Casas sketched him in charcoal in front of the Exposition building, and in turn Picasso portrayed himself with his friends – Casas, Utrillo, Pichot, Casagemas, Germaine and Odette – outside the Exposition, or in Montmartre with Pichot, Pere Manyac, Casagemas, Jaume Brossa and Pompeu Gener. This first stay in Paris was concluded at the end of the year, when Picasso went to Málaga, and later to Madrid to launch his project for the Art Nouveau magazine Arte Joven. 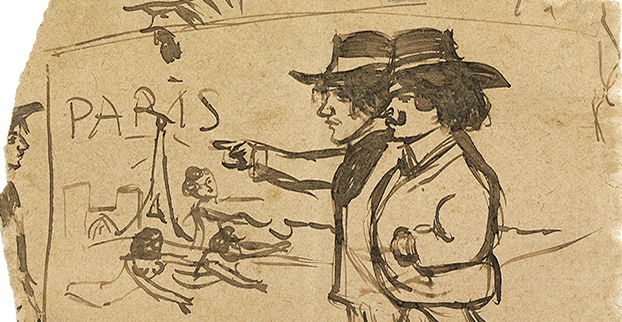 In May 1901 Picasso was back in Paris for the joint exhibition that Pere Manyac had organized for him and Francisco Iturrino in Ambroise Vollard’s gallery. Picasso arrived with some pictures he had made in Spain, but he had to work intensely to fulfil Manyac’s plan. 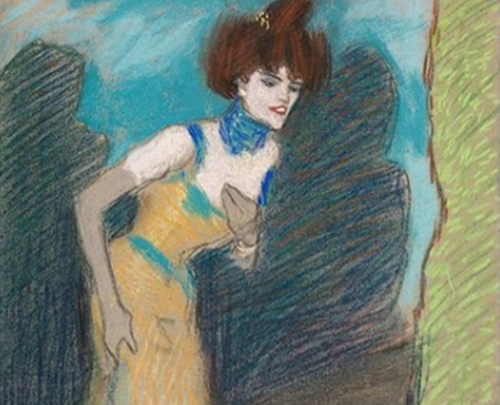 He completed about sixty paintings, using thick short brushstrokes of pure colours to deal with Parisian themes – nightlife, street scenes and even some fashion sketches – in which the influence of Steinlen, Toulouse- Lautrec and the Post-Impressionists is apparent. The show was fairly successful: several works were sold and the notices in the press were fa- vourable. After the exhibition, Picasso took heed of Fagus and reined in his impetuosity, moved away from the vivid chRometism and began to look for a new path, closer to symbolism but assimilating the lessons in everything he saw: from the themes and tenuous colouring he found in Carrière, Denis and Puvis de Chavannes to the handling of com- position in Gauguin, Manet, Degas or Cézanne. These thematic and chRometic changes led him to the more intimate and symbolic painting that he explored from that moment until mid-1904, the so-called Blue Period. At this time Picasso was alternating between Paris and Barcelona and practising an intimate and almost monochrome style, influenced not only by certain other painters but also by his friendship with Max Jacob, who introduced him to fin-de-siècle French poetry. In April 1904, Picasso, accompanied by Sebastià Junyer Vidal, finally made his move to Paris and installed himself in Montmartre. A decisive factor in the changes that his life and work underwent at that time was his friendship with poets such as André Salmon, Max Jacob or Guillaume Apollinaire, in addition to his association with Gertrude and Leo Stein, through whom he came into contact with leading figures in progressive artistic and intellectual circles and took his place in the French avant-garde.